The straightest line on any map. 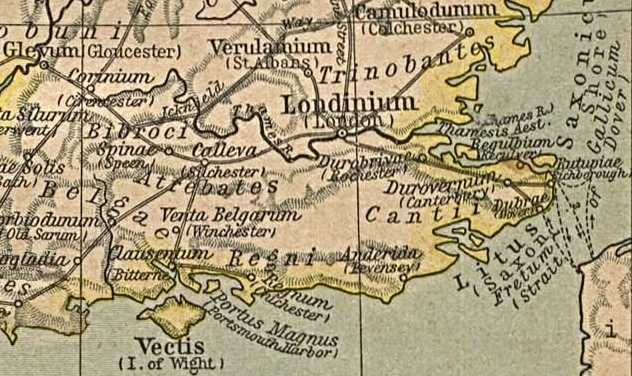 In southern England, as in much of Europe, straight lines most often record the course of a Roman road. 2,000 years later, Roman roads form an important part of our transport network, even today. Their arrow-straight trajectories define the traces of many of the modern roads which radiate out of London. Even in this wildest and most remote colony of the Roman world (and perhaps especially here), the Roman legions had to travel. Trade needed to flow. The effective linking of the farthest outposts of Empire was necessary not just for military protection, but also fundamental to the process of Romanisation. The traveller passing from Dover to London along the A2 and continuing northwestwards on the A5 from Marble Arch to St Alban’s is following Watling Street, all the way. Northeast to Colchester – and the A12 runs along a Roman road. The A10 and A11 from North London towards Cambridge are Roman, too – and their bigger sister, the A1 Great North Road (Ermine Street) is a Roman route, as well. Travel south to Chichester, and the A24 and A29 follow Stane Street for most of 57 miles, along a course laid out by the best engineers in the world – in the middle of the first century AD. How many shoppers ambling idly along modern-day Oxford Street and strolling on to Bayswater Road beside Hyde Park have time to think of history ? And yet, they are walking down a Roman road. Keep going that way, and you can follow the legions right through Chiswick, past Brentford and Heathrow, and on to Roman Ad Pontes (Staines, a corruption of ‘Stones’) where the Romans crossed the mighty Thames. And so the list goes on. We use these routes, every single day and without thinking, but amongst today’s traffic their existence is much too easy to forget – since over two millennia, all those Roman roads have been rebuilt, of course. Many more have been lost to history, although maps can hint at where they might have run. Just south of Staines, another Thames crossing at Chertsey may have been the start of a Roman route to Venta Belgarum (Winchester) along Stone Hill in Chobham. But although the road and field boundaries beyond are straight, there is precious little evidence to see from on the ground. So many Roman roads, and all of them rebuilt, forgotten, or lost completely. Well – not quite all of them. That Roman road through Staines was the main link between London and Calleva, an important Roman town which now lies largely unknown in fields near Silchester, a small village to the south of Reading. The existence of a knife-straight, partly paved highway lurking in the Berkshire woods and leading nowhere in particular provoked mediaeval mystery, as past centuries wondered just how it got there. The Devil’s Highway. And it’s still there today, amidst a hundred other tracks which criss-cross the Berkshire woodlands to the south of Bracknell. Ironic in a way, that this feat of Roman engineering should hide so unheralded beside this post-war town, home of the UK’s flourishing technology industries and which hardly boasts a single building more than fifty years old. And yet, with so much twentieth century development plastered atop the landscape, perhaps it’s even more remarkable that any trace of the road remains at all. 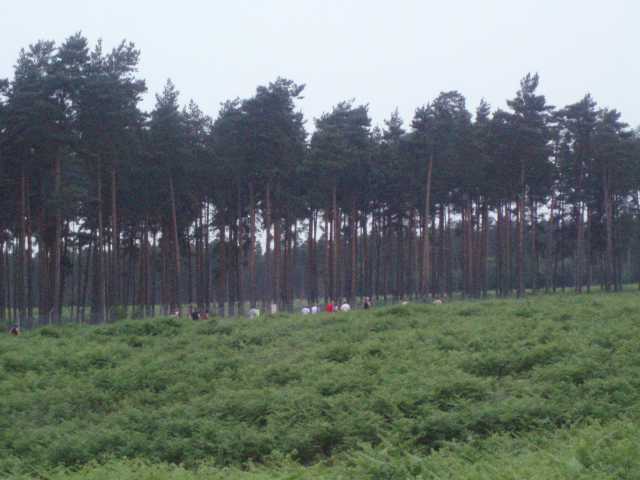 The Bracknell Forest Five is an evening race like many you’ll find in southern England. Fairly short, informal, friendly, superbly organised. Perfect for the casual athlete who fancies an energetic outing after work. 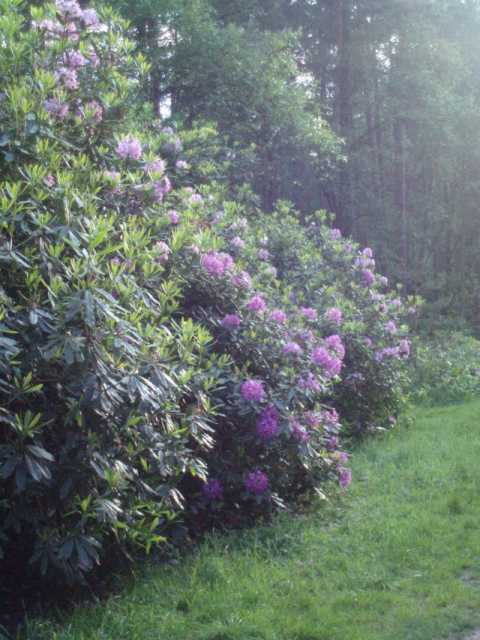 The route runs along sandy trails across the heath – amongst trees and ferns, and stones and flowering rhodendron. Tracks which look all the same beneath the evening clouds. We climb towards the reservoir, up to Caesar’s Camp – an inaccurately named set of earthworks dating from the Iron Age – a time already as remote from Roman times as the Black Death is to us today. For fortythree minutes I run – through early evening drizzle and softly falling summer rain. It’s not that long, and not that far – and yet this distance speaks of prehistoric Britain and the Roman Empire, and says so much about the nature of half-forgotten history in our Silicon Age, as well. Just five miles run tonight. 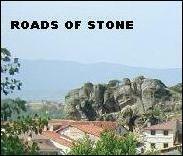 On one more road of stone. 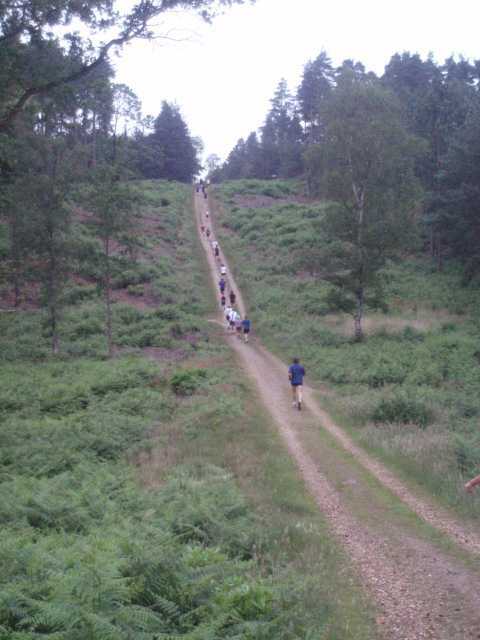 This entry was posted in 2007, history, London, racing, summer. Bookmark the permalink. I recognise that path, you’re near Broadmoor aren’t you? I used to run along the Devils Highway to get to Caesar’s camp. That’s right, Jonas, although this one leads from London to Silchester (Roman Calleva). And Angela, yes, you’re in the ballpark there. I’m travelling today, and will come back and complete this shortly. Thanks for bearing with me in the meantime. It’s much easier to remember the Roman roads around here as some have retained their Roman names. The most well-known in Montpellier is the Via Domitia which runs east to west. Parts of the original road in the countryside have been excavated and you can walk along the cobblestones and sit in the remains of the strongholdings. I love being surrounded by so much history. It makes me feel very cosy for some reason. Great post. Made me feel like digging out my running shoes! And don’t forget Edgeware Road which I think is the longest Roman road in these parts, with people from another Empire living all along it. Sarah – sadly I don’t know Montpellier all that well, although I was an examiner once for a PhD thesis on the geology of St Chinian – a happy memory which I’ve managed to keep alive through buying red wines from its vineyards ever since. I agree with you that the pulse of Roman life still beats strong across the south of France – those arrow-straight Routes Nationales across the Carmargue, the Pont de Gard and the marvellous amphitheatres of Provence all create a far more obvious footprint on the landscape than in Britain, where such treasures require more effort to find. The Roman streets of Vaisons la Romaine are particularly atmospheric – and that’s another place which produces fine reds (perhaps there might be a theme developing here ?). Wombats – yes, I should have identified the A5 in London as Edgeware Road. That route (Watling Street) runs much further than St Alban’s (Verulanium), too – past Milton Keynes, across the Midlands and on to Chester (Roman Deva). 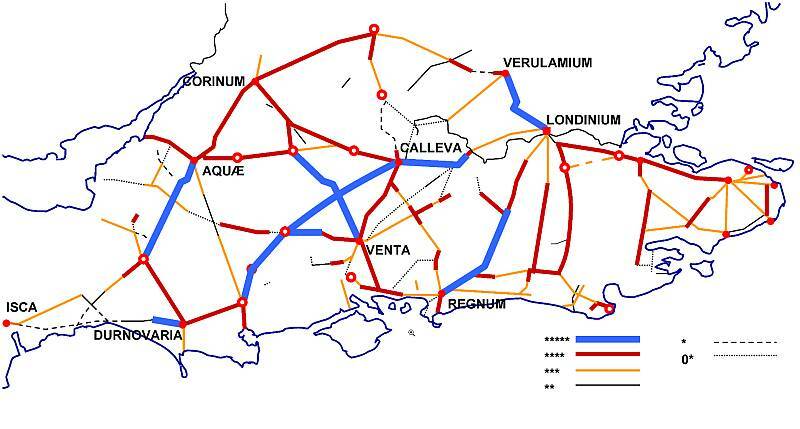 You might like this map of Roman Roads in southern England, which is by far the most comprehensive I’ve found so far.